Last weekend, I felt the urge to bake...surprise, surprise! 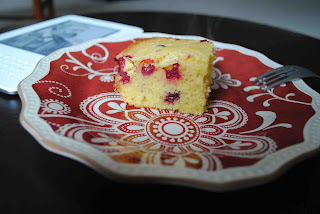 I had some cranberries in the freezer leftover from our holiday salad, so I thought of things I could do to use them up. I can't remember how, but I ended up on I Will Not Eat Oysters, and decided to adapt this recipe to suit my needs. Paired with a big mug of tea, it was a delicious way to start the day. With the rest of our beautiful Saturday, we took a trip to walk around the shops of a nearby village. I got my first candy cane of the season from a Santa who was walking out of a pet store! In a large bowl, whisk together the butter, eggs, and buttermilk until well combined. In another bowl, combine the cornmeal, flour, sugar, baking powder, and salt and mix until it looks uniform. Mix the dry ingredients into the wet ingredients with a wooden spoon. Add in the cranberries and gently mix them into the batter. Lightly grease a 8x8 inch square pan. Pour the batter into the pan and bake at 375 degrees for 25 minutes, or until golden brown and a toothpick inserted in the center of the pan comes out clean. Let the bread cool for about 15 minutes before serving.